Afgan FigDeciduous shrub or small tree. Native to Iran and Afghanistan. Grayish-green snowflake shap..
ForsythiaDeciduous shrub. Moderate growth rate. Vase shaped. 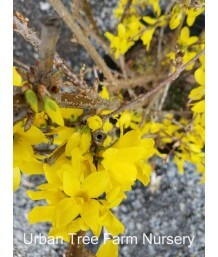 Brilliant yellow flowers late winter/ea..
Forsythia/CourtasolDeciduous shrub. Compact and spreading habit. Heavy blooming plant noted for prod..
ForsythiaDeciduous shrub. 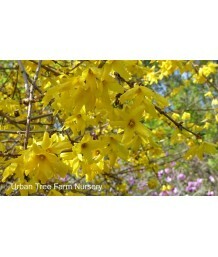 Vigorous, heavy blooming plant noted for producing a spectacular late wint..
ForsythiaDeciduous shrub. Moderate growth into an upright form. Showy, rounded shrub covered in an a..